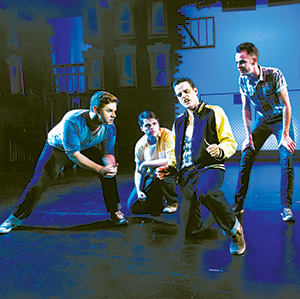 Inspired by “Romeo and Juliet”, in “The West Side Story”, based on the book by Arthur Laurents, with Stephen Sondheim’s compelling lyrics, and Leonard Bernstein’s music, Shakespeare’s timeless tragic tale is transformed into a war between the members of two rival gangs, in New York. At City Lights, the drama unfolds in an intimate setting, with Ron Gasparinetti’s simple simple set design, under the brilliant direction by Lisa Mallette, and does not lose any of its flair. Large cast of 26 members, deliver beautifully. The casting is superb. The tale of turf war starts as the Jets, an older gang of primarily Italian, Irish, Polish youngsters feel challenged by the newer Puerto Rican immigrants, the Sharks. When Tony (Max Jennings), a Jet, and Maria (Katherine Dela Cruz), sister of a Puerto Rican Shark, fall in love, the tensions between the two rival gangs escalate dramatically, resulting in a series of violent events and ultimately leading to irreversible heart-breaking tragedy. Dela Cruz’s operatic delivery of all her pieces is most impressive, and tugs at the heart strings. Danielle Mendoza, as Anita, Maria’s girl friend, Sean Okuniewicz (Action), leader of the Jets, and Nick Rodrigues (Bernardo), Maria’s brother and leader of the Sharks, are also fantastic. Tony and Maria’s intermittent romance, amid atmosphere of inexplicable bitterness and hate, is endearing and also saddening, in the light of the tragic events that are to follow. Sometimes, it seems that the presence of caring adults, with compassion, and wisdom that only comes with years, could make a difference, and bring a dose of reality to young people, who may be on the verge of losing their footing. Unfortunately, in “The West Side Story”, the adults fall short. The candy store owner, Doc (George S. Gemette) cares deeply, but is powerless, and throws his hands up in the air in frustration, as he says, “you kids make this world lousy; when will you stop?” Officer Krupke (Howard L. Miller), on the other hand, is the wrong face of the law enforcement, representing the type of attitude that was all too common, but one that is rapidly changing. Some telling lyrics below, sung by the Jets, represent their cynical take on the perspectives of those in the law enforcement. Very insightful and infinitely saddening, these lyrics sung with rebelliousness, sarcasm, distrust, and contempt towards the law, and all who stand for it, indicate that sometimes these juveniles are acutely aware of how they have been written off as “no good”, by the law enforcement. You down the station, ya punk? 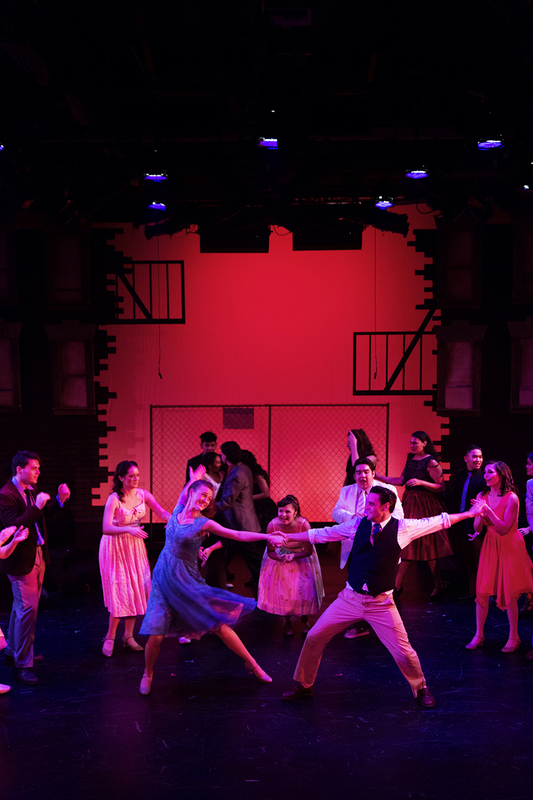 Like the timeless story of Romeo and Juliet, “The West Side Story” has also rightfully acquired a place as a timeless classic, in the history of urban America. City Lights has done a fabulous job in bringing this heart rending saga of love and tragedy; in this massive production, with a huge cast, on stage. Seats are available only for a few of the remaining shows. Book your tickets at www.citylights.org .